This is not breaking news, as Facebook has offered this functionality for a while but, like myself, it might take a reminder to actually start using it. For those who are not yet aware, Facebook is trying to make Twitter irrelevant. With the last major layout change Facebook added a scrolling section of “live” updates trying to replicate Twitter’s timeliness with updates. If you’re like me, you have probably completely ignored this box, located in the right top-hand corner of your news feed. This is just a small change to replicate Twitter – the big change comes with subscriptions. 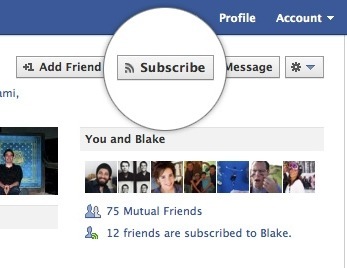 Facebook Subscriptions allow users to “follow” “interesting people” such as celebrities, blogs, comics and other pages. The major change is that you can receive updates from those you do not know if someone has opened up their page/feed to subscriptions. This works exactly like Twitter in that they do not have to have any affiliation with you for you to be able to see their public updates. By default you are subscribed to all of your friend’s feeds, which makes sense. You can unsubscribe from your friends as well, clearing up noise from those who insist on hating everything on this planet or who persistently share everything including their bowel movements. The universal “subscribe” functionality makes a lot of sense to me and is a welcome addition to Facebook. As long as other celebrities dedicate their efforts to Facebook, this could theoretically end up as a great reason to leave Twitter. Of course, you can’t speak directly to people who are not your friends which is one of the great things about Twitter. With that being said, what do you think, are subscriptions a good answer to Twitter? Assuming you can find all the people on Twitter to subscribe to on Facebook, would you consider dropping Twitter?